Pneumatic pressure sensor for measuring very low gauge reference pressures with ranges starting from 10 mbar (4 inH2O) up to 1000 mbar (400 inH2O) gauge. Ideal for use on pneumatic control systems, heating, ventilation and air conditioning systems (HVAC) and computer equipment rooms. The DMP 343 pneumatic pressure sensor uses a highly linear exposed piezoresistive silicon element to measure the pressure of air, gases and non-aggressive low viscosity fluids. Using an exposed silicon diaphragm increases its sensitivity and improves the performance at very low pressures. An amplified voltage, 2 wire current or 3 wire current loop output signal format. There is also the option for ATEX/IECEx approved intrinsic safety with the 2 wire 4 to 20 mA version. Monitoring suction pressure of an industrial fan or blower. Measure the extraction pressure used to remove exhaust gases & moisture, accelerate drying processes, cooling manufacturing processes & electrical equipment, and ventilating work spaces. Leak testing a gas meter by applying air pressure and checking decay over time. Control a fan to maintain a constant air pressure on a supply duct with varying flow. Measuring the relative pressure between the inside of a glove box and room pressure. Measure the pressure of a chamber filled with Argon gas. Is there a way to use this pressure sensor on higher temperature ducted air than the upper spec limitation of 125 degrees Celsius? The usual solution is to use a ‘stand-off’ which is simply a piece of ‘dead-ended’ connection pipework which re-locates the sensor to a cooler zone. The air will be too hot at one end of the stand-off pipe, but will be cool enough at the other end, closest to the sensor, due to the surrounding ambient temperature along the stand off pipe connection. Also it can help to mount the sensor and stand off pipe below the duct where the ambient air temperature should be cooler than the air directly above the duct. Can the version with a DIN plug be used in a dusty factory environment to measure vacuum pressure on a biomass rotary dryer? The ATEX version is approved for use in potentially explosive dusty atmospheres, when installed with a zone barrier (not provided), the DIN plug is IP65 is properly installed to the signal cable, which should be adequate to prevent dust ingress. 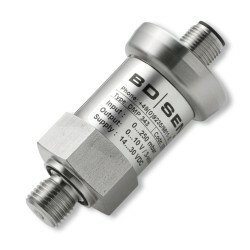 Can we use this pressure transmitter to communicate with a PLC or other controllers? The sensor has a 4-20mA 2 wire current loop output signal, which is an industrial standard input for most PLC or controllers. What is the difference between the two models DPS 300 and DMP 343? The DPS 300 is a gauge/differential pressure range (2 ports) device with minimum range of 1 mbar, whereas the DMP 343 is a gauge reference pressure range (one port) device only, and minimum range is 10 mbar. What are the I.S. barrier loop details so that I can choose the right one? Ui = 28 V; Ii = 93 mA; Pi = 660 mW; Ci ≈ 0 nF, Li ≈ 0 µH, the supply connections have an inner capacity of max. 27 nF to the housing plus cable inductivities 1 µH/m and cable capacities 160 pF/m (for cable by factory). Permissible temperatures for environment: -20 … 70 °C for type DX-19 *** i: -20 … 65 °C in zone 0 (patm 0.8 bar up to 1.1 bar): -20 … 60 °C. We need a pressure transmitter with 4-20mA output, DIN plug style connector and 14″ BSP male thread fitting, to measure -10 to +10 mbar, we have been using a 500 mbar rangeable pressure transmitter but it has been drifting too far. Would the DMP343 be able to measure over this range and would it be very stable over time? Turning down a range is normally limited to 5 or 10 to 1, and any lower than that you should expect to notice significant deterioration of accuracy and stability relative to the output signal span. The DMP 343 is a lower range device, so it is better suited for measuring over a -10 to +10 mbar range. The sensing technology is silicon diaphragm based, which is considered to be the most elastic material you can use for diaphragm based pressure sensors, and therefore the least likely to drift. However measuring very low pressures with diaphragm based technology becomes increasingly difficult the lower you go in pressure, due to the increased sensitivity of the sensor to external influences of variation in temperature & vibration. Therefore high accuracy & stability become increasingly difficult to achieve. The DMP 343 has an accuracy of 0.5% FSO, with a full scale being 20 mbar is this case. There is also temperature errors of 1.5% over a media operating range of 0 to 50°C. The long term stability is better than 0.3% per year at reference conditions for pressure ranges lower than 100 mbar. We are considering this transducer and we are at a final stage. We think we could make good result, however we would like to check the specification to make sure before the final decision. The type of DMP343 we want is one which will be able to measure negative gauge/suction pressure. According to our specification, the model should be DMP343 100-1000-1-5-M10-N40-1-000, is this right? The correct part number should be 100-X101-1-5-M10-N40-1-000, this is a suction pressure range, it is not shown on the data sheet because it is a custom pressure range that is not offered as standard. I’m looking for transmitters to use in a safety system to automate a facility. The tanks hatches are rated to vent at 11 oz/in². So we are looking at pressures less than 1psi to -1psi. Because the range is so small, we would need the transmitters to measure vacuum in oz/in² or inH2O and not psi. This is a Class 1 Div 1 and Class 1 Div 2 location. The DMP 343 can easily measure 11 oz/in² with a 0 to -1 psi negative gauge range, and is IECEx approved for use in explosion hazard zones to comply with many international certification bodies. What is the measurement response of the DMP343? What maximum overload pressure will a 25 mbar DMP343 low range air pressure sensor take before the accuracy is affected? For a special scaling of 25 mbar the standard 40 mbar range will be used and this has a permissible overpressure of up to 300 mbar. How should the DMP343 low range pressure sensor be installed as part of a control system to ensure a positive interior air pressure is maintained above a set level? The sensor can be mounted from the inside so that the negative side of the sensor is vented to air pressure inside the enclosure. The positive side will be open to outside ambient air via the hole it is mounted to. In this configuration the sensor will be measuring a negative pressure and it will be protected from the outside environment. However, if the inside pressure is too dynamic the response of the sensor maybe too slow in this configuration due to the vent path on the negative side of the DMP343. The other possible configuration is to mount the DMP343 on the outside of the enclosure. The negative side will now be vented to outside ambient air pressure and the positive side to inside pressure. In this installation the sensor will measure a positive pressure and be more responsive to fluctuations of the interior pressure. The downside of this configuration is that the DMP343 will now be protruding from the enclosure box and will be exposed to the outside elements, which may require more robust environmental protection. I see that the DMP343 is only suitable for non-corrosive gases, so would it be suitable for Natural gas in that case? The DMP 343 component materials which are exposed to the media include stainless steel 1.4404 (316L), silicon, epoxy or RTV, mineral glass, and some of these will be vulnerable to corrosion when exposed to Methane over long periods. Alternatively we would suggest the IMPLR for non-ATEX approved installations and the DMP331 for ATEX approved installations. We are measuring air with very high humidity, and for the parts exposed to the air, the alloy used in the DMP343 is AISI316L, which theoretically has better humidity resistance than the AISI303 used to make the IMP-LR. Why would the latter be better suited for the application? Has it something to do with the isolated diaphragm? Yes the IMPLR has an isolation diaphragm protecting the components that make up the sensor assembly, whereas the sensing components on the DMP343 are exposed. The DMP343 is designed for measuring normal air and there are more materials other than stainless steel 316L used in the construction which are exposed to the media which includes RTV, ceramic, mineral glass, silicon and FKM. The IMPLR has all stainless steel 303 process port, stainless steel 316L diaphragm & various seal options, so it can be used on liquids or gases. The DMP343 will work fine on normal air, it is only if the air has an unusually high mosture content or there is high levels of condensation that you should consider a sensor is intended to be used with liquids. 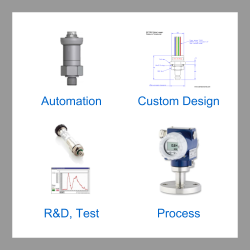 Please select the options you require for the DMP343 Low Range Pneumatic Pressure Sensor in your application and request a quote. Send us your enquiry for DMP343 Low Range Pneumatic Pressure Sensor to get assistance with this product type.